Come On! You Know You Wanna! Are You A Woman? Have You Received A Cancer Diagnosis? Do You Want to Have Some Fun? Answer "Yes" to All Three? Excellent! This is the Adventure for You. Read On! You qualify to attend our New Participant Retreat! Our retreat programs began in 1998. We hosted one retreat that inaugural summer and over 110 more since then. 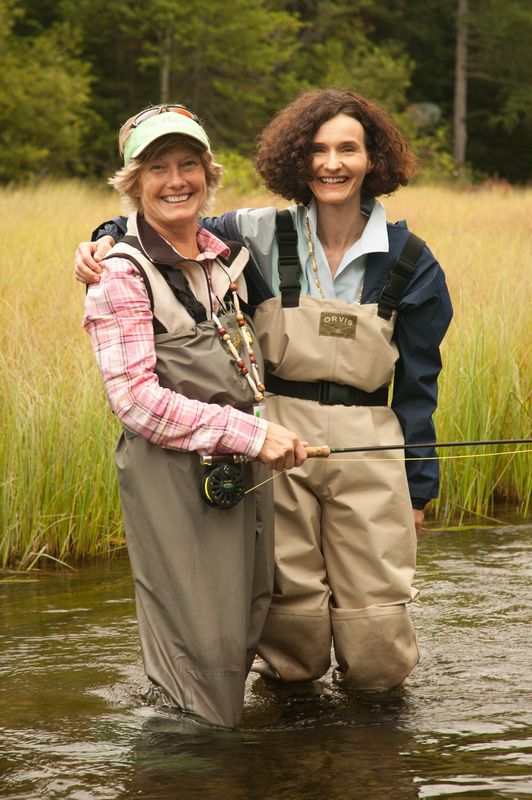 We've been privileged to share the joy of fly fishing and a retreat away from cancer with over 1,815 women who were battling and surviving cancer. And you know what? We can't wait to meet YOU! You probably have some questions. We answer a few below and hope it will help you decide to complete the registration packet and join us. WHAT KIND OF DIAGNOSIS IS REQUIRED TO ATTEND? WHAT ABOUT MY HEALTH? OH, AND THE COST? Any woman, 18 years old or older who has received a cancer diagnosis may attend this retreat once. Women in all stages are welcome. The type of cancer and treatment does NOT matter. Your health status does matter though. Everyone is different when it comes to health, stamina and physical abilities. You need to assess where you're at with these areas, and if needed, discuss with your doctor and our retreat coordinator. We've had women attend who are in active treatment, others who just graduated from treatment, as well as those who have been out of treatment for 1, 5, 10 and +20 years. Costs to attend include a $30 registration commitment fee, a one-day fishing license (if applicable), and your transportation. We try to accommodate dietary requests and physical limitations (some locations are not wheelchair accessible). What do we do? fly fishing? Really? Well, first off, this is a retreat AWAY from cancer. We focus on taking a break from that word and all it entails, by replacing it with fly fishing, which includes doing something new, adventurous, challenging and fun. We don’t sit around and force anyone to discuss or share their cancer journey. If it comes up in conversation, so be it. Also, this break is focused on YOU learning to fly fish for trout in a beautiful setting with a group of supportive, heart-centered volunteers. If you don’t want to learn anything about the sport of fly fishing, then this isn’t the retreat for you. If you do, well, this is definitely the place you want to be! In less than 24 hours from your arrival, you’ll be geared up to fly fish in the river with a volunteer guide. If you only want to learn a little bit about the sport, we're OK with that. If you’d like to learn more, soak it all in, perhaps catch a trout, well, we work hard to make it happen. Other than fly fishing, there’s food, camaraderie, laughter, high-fives and the healing setting of the nature around us – river, trees, birds, eagles, chipmunks and more. Sometimes even a campfire under the stars. You can find answers to other questions and more retreat information in Frequently Asked Questions, FAQs, send an email at info@FishOn.org, or leave a Voice Mail at 616-855-4017.